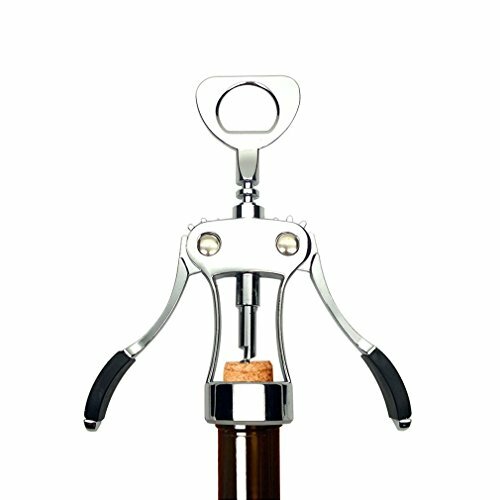 If you enjoy abottle of chardonnay or merlot, but have a hard time opening the cork, then Pella has designed a luxury, heavy duty, industrial grade winged cork puller to make this task simple and easy. Whether its a bottle of red or white wine, this manual cork extractor makes opening wine a breeze. The traditional winged corkscrew by Pella is designed to easily open corked wine bottles, even for men or women with weak hands or poor grip caused by arthritis. #1) Offers a two-inchwide turning knob that is comfortable to grasp and will effortlessly turn to twist the non-stick coated screw into the cork. #3) With a stylish silver finish, this wing cork remover features a fancy and sleek modern look and is designed with a polished helix for easy cork insertion and double wing construction for stable and uncompromising leverage. Life in the kitchen is easier when you use the right tool for the task, and the Pella wing corkscrew offers an elegant and foolproof way to open a bottle of wine. With a 100% money-backguarantee, you've got nothing to lose. It's a no-brainer to give this product a good try. So don'thesitate ... scroll to the top of this page and click "Add to Cart"now! BEST DESIGN - Designed in a style guaranteed to never go out of fashion. 2 FUNCTIONS - you can use it as wine opener,and also could use as bottle opener. EASY TO USE - It goes into the cork without too much effort and when you go to pull the cork out, it comes out without too much effort. LIFETIME WARRANTY - We have a commitment to every buyer 100% user satisfaction, so if you have any problem about our PELLA Wing Corkscrew Wine bottle opner, just contact us to refund or return. RISK-FREE! If you have any questions about this product by Pella, contact us by completing and submitting the form below. If you are looking for a specif part number, please include it with your message.